Home » Taxi App » Infinite Cab – On demand taxi booking app with advanced features to build and grow taxi business Faster! Recently the use of On demand taxi booking app increases and it has greatly influenced passengers day to day life. For hailing a taxi, the people use Infinite Cab – on demand taxi booking app which allows them to find taxis near their vicinity and make the transportation more comfortable. 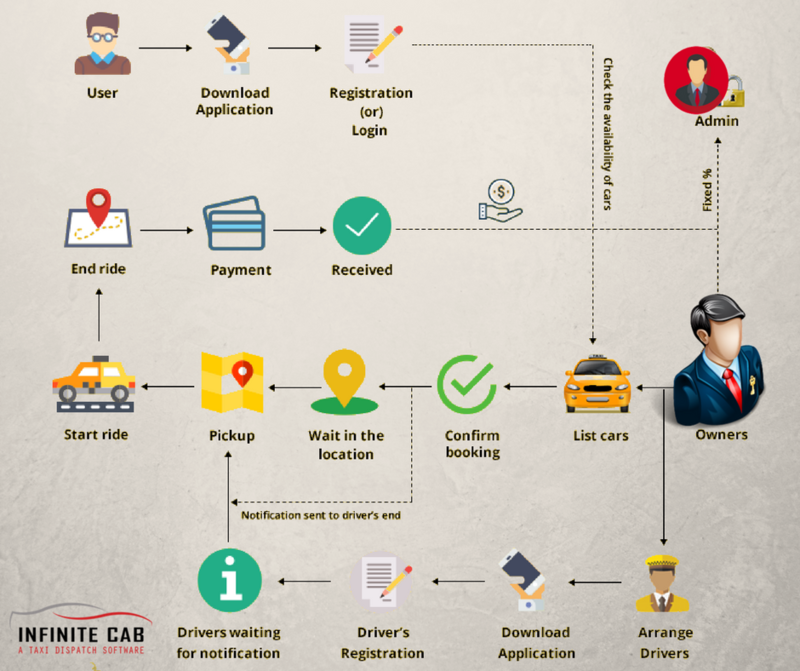 How does Infinite Cab – On Demand Taxi Booking App works? Initially, the user has to download the taxi booking app via Android or iOS operating system supported mobile phones. Now the user needs to login to the taxi app for providing all information. Now the user can check the availability of cars and can also choose the type of car which the user prefers. When the user confirms booking the taxi a notification will be sent to the taxi driver and taxi business owner. Now any available driver near to the passenger’s location will accept the request and reach the pickup location. The user can also track the driver’s path using GPS tracking system and can also know the estimated time when the driver to reach there. After dropping the passenger at the destination, the driver is allowed to collect money from passenger only if the passenger doesn’t make payment while Registering. Infinite Cab – on demand taxi booking app supports Bitcoin Payment method also. Once the payment is received by the driver a notification will be sent to the taxi business owner. The taxi drivers, arranged for taxi business will be provided a driver – on-demand taxi booking app. The driver has to sign up using the app in order to become eligible to provide taxi service to passengers who request cab service to the taxi company. After successful registration the drivers will get notification from all passengers who looks for hailing taxi. The Admin Can Monitor over all actions that takes place in Taxi Dispatch Service. Admin provides drivers and passengers to access the features of taxi booking app. What are the benefits of using Infinite Cab – On demand Taxi Booking App? On demand taxi booking app helps the passengers from not losing their valuable time for searching taxi on streets. Taxi booking app allows them to access the taxi they want simply by sitting indoors. GPS tracking feature included in Infinite Cab – taxi booking app helps the passenger to track the driver’s path. Auto Fare calculation feature included in taxi booking app helps the passengers to get an idea of taxi fare. This greatly helps cab passengers by not getting cheated. Infinite Cab – on demand taxi booking app already has a base taxi booking app solution resulting in faster time to market and lower development costs. Provides optimal trips for both drivers and passengers to ensure a sustainable business model. Infinite Cab – On demand taxi booking app is a very user-friendly option to meet the expectation of each customer. Infinite Cab – taxi dispatch software can be customized with provision for new features, enhancements, and integrations. You can deploy Infinite Cab – Taxi Dispatch software on your server, giving you full ownership over the valuable user data generated. Infinite Cab provides highly talented professional developers to successfully launch taxi booking app. Launch your app in different regions with multi-currency and language support. Infinite Cab – taxi booking app can add the payment gateways choice with built-in support for the most popular ones. Taxi booking app development solution of Infinite Cab is built on a robust cloud infrastructure with ease & we offer high scalability as per your business requirements. Infinite Cab – taxi booking software development team provides 24 hrs support to customers in case if any error occurs in taxi booking app. The advanced features deployed in Infinite Cab – On demand Taxi Booking App helps the small taxi business and medium level taxi businesses to grow faster and to establish taxi business networks globally. Check taxi dispatch software demo of Android and iOS platforms for passenger and driver taxi booking app to evaluate its performance. 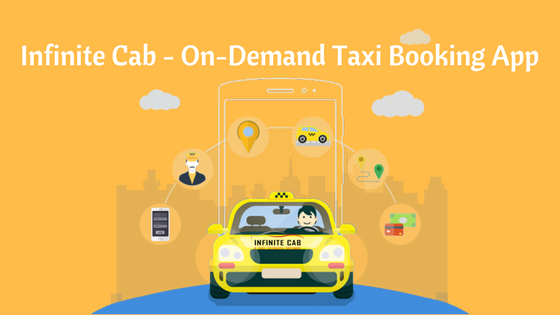 No Thoughts on Infinite Cab – On demand taxi booking app with advanced features to build and grow taxi business Faster!